Next weekend, you can find a lot of Los Angeles’ local goods downtown in one spot thanks to Artisanal LA. It takes place in The Cooper Building and not only will you be able to shop, you’ll be able to attend live workshops and more. Saturday, there will be a Sustainable Caviar Cooking Demo and Tasting by Christopher Klapp and Chef Ben Bailly, aÂ Hand Made Egg Cozies Demo by Common Thread Studio, a Growing and Cooking With Artisanal Pumpkins Demo by Peninsula Hotel’s Chef James Overbaugh. On Sunday, Suzanne Griswold and Rachael Narins of Chicks with Knives will be doing a Pickling 101 demostration and tasting as will The Beer Chicks be hosting a Craft Beer Panel (and tasting) featuring brews from Eagle Rock Brewery & Nibble Bit Tabby, the recently opened brewery in town. You can also peep the full vendor list here. Admission is $10 in advance or $15 at-the-door and includes Honest Tea, Dry Soda, Function and Bonadea drinks; local craft beer and organic spirits tasting (for 21+ only); a tote bag for the first 1000; access to the workshops, demos, arts and crafts; a chance at giveaways;Â unlimited re-entry for the weekend and partial proceeds to the LAUSD Edible School Garden Programs. DJ Bryan Davidson will be spinning the tunes. So buy your tickets in advance and save yourself $5 – as well as guaranteed entry since the lovely organizers are expecting to have to turn people away at the door. 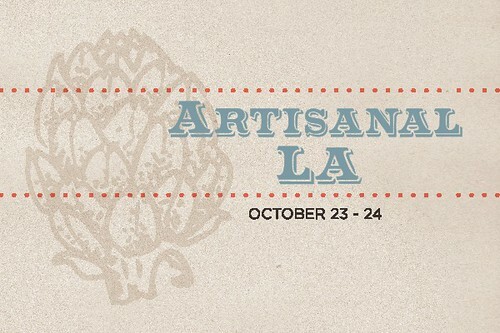 I’m also giving away a couple tickets here on the blog, so simply comment in this post with what you are most looking forward to at Artisanal LA for your chance to win. Entries will close on Wednesday, October 20 and I’ll inform the winner that night. This entry was posted in beer, cocktails, Downtown LA, Events, Food, Giveaway, Shopping and tagged Artisanal LA, beer, Chicks With Knives, Cooper Building, downtown los angeles, DTLA, Eagle Rock Brewery, edibles, ethical, Food, giveaway, handmade, L.A., local, Nibble Bit Tabby, sustainable, The Beer Chicks, ticket, weekend. Bookmark the permalink.